The common diet wisdom for endurance athletes is to consume plenty of complex carbohydrates. Pasta is supposedly the king of complex carb sources, with rice, millet, barley et al running a poor second. For many years, pasta was on my dinner table two or more nights a week. Having changed our meal planning to incorporate more variety, I tossed out most of my recipe collection. Of those remaining, two are foremost. One is pesto, which isn’t an option yet as our basil won’t be ready for a couple of weeks. The recipe below remains a perennial for meal planning. It’s simple and fast to prepare. Prosciutto is delicious, and a little goes a long way to make a meal. Add in some portobello mushrooms, and you’ve got a tasty dish. Parmesan cheese is optional. 2 1/2 cups frozen peas. Set a pot of water to boil. Once the water is boiled, cook pasta according to instructions on the package. While it’s on the stove, cook the minced shallots in olive oil until they soften. Add the prosciutto and minced garlic and saute over medium – low heat for 5 minutes. 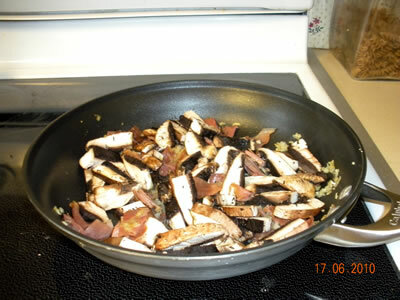 Add sliced mushrooms; cook 5 minutes or until the mushrooms are almost done. Add in frozen peas and broth. Bring the broth to a broil, then reduce heat and simmer until peas are cooked. A tablespoon of Marmite blended with water makes a nice alternative to broth. Drain the pasta and mix with peas, prosciutto and etc. If you opt for parmesan, be mindful of the saltiness of both the prosciutto and the cheese. 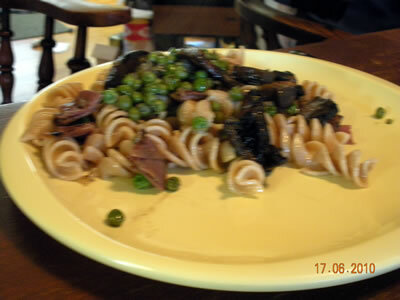 This entry was posted in Cooking, Italian, Recipes, umami and tagged mushrooms, parmesan, peas, prosciutto, shallots. Bookmark the permalink.